Bits and pieces of information are leaking from time to time about K.J. Parker, but most of the presence of this author remains under a veil of mystery. I admit that I am a bit curious about who K.J. Parker is, but rarely am I bothered by my curiosity because it is a while now since I fell in love with her (most of the sources I found refer to K.J. Parker as a female) works. Without having a problem with the mystery surrounding K.J. Parker I gladly opened the front cover of her latest novel, “The Folding Knife”. Once again K.J. Parker proved, if that was still necessary, to be an intelligent, careful and talented writer. She crafts a world and a story that without the secondary world elements will seem to be a historical recollection or a biography. K.J. Parker lays strong foundations to her creations, world, character and story, building from there without the fear of the novel crumbling on itself at the first logical question. “The Folding Knife” is not a fast moving novel, on the contrary it will seem to crawl, but that doesn’t reap anything from the enjoyment of the reader, because the novel keeps a steady and natural course, moving constantly forward without uneventful parts or falls into stereotypy. The story gravitates around the main character, Bassianus Severus shortly known as Basso, the only major presence of the novel. Since it is the story of his life, or more exactly a part of his existence, it cannot be otherwise. The reader learns of the fate of Basso even from the introductory part, but the journey that leads the character to that point is as interesting as it is unpredictable. However, once the story reaches the same point it doesn’t simply end, but it extends into every reader’s imagination, Basso’s fate being far from sealed with the end of the novel. Basso is an ambitious, cunning and selfish character, but his flaws as much as his qualities are making his presence so much stronger. Basso is not a positive character, but not a negative one either, he just acts according to his principles and interests. K.J. Parker helps her character develop with the relationships that Basso has with a few other characters, the influence that he has on them and they on him. Although Basso’s relationship with his sister goes as an undercurrent it is the most important one, stretching in many directions and affecting Basso’s development and actions in many occasions. The side characters do not rise at the level of Basso, but help the reader look at the events in which the main character isn’t involved directly. Because every little event, involving or not the main character, has effects on his actions and further development of the story in one way or the other. Piece of information or events that seem to have no importance will prove to be a sequence of a mesmerizing butterfly effect that takes place in “The Folding Knife”. Through the characters of the novel we can see a few interesting threads on politics, economics, society and war, touched on philosophical level and tickling the mind of the reader. I especially liked the correspondence between Basso and Bassano, his nephew, a series of letters towards the end of the novel that present some interesting concepts on war and humanity. The setting of “The Folding Knife” is a world resembling the ancient Roman civilization in its republic phase. The work on the setting is truly impressive, K.J. Parker treating every detail with great attention, regardless of the importance of its role. Historical, political, military, economical, demographical or religious each of these aspects makes their presence felt and bring the Vesani Republic and the world around it fully into existence. The economy is the most important wheel of this assembly, the author throwing a light on the public, private and social sectors and the important part played by services and finances on these sectors. There are a few times when the economical part might be confusing, but once I went over the respective part again things became clear again and in the wide perspective revealed by the further reading they became clearer. 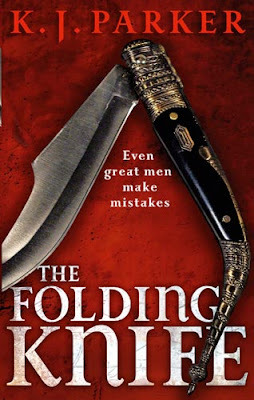 “The Folding Knife” has no action that emphasizes on physical qualities, but that should not drive readers away from this novel. As life offers smaller or bigger events each day so is “The Folding Knife”, with something happening with each page and chapter. As for the author of the present novel, I read enough of her works to say that every list of top genre writers would not be complete without K.J. Parker’s name on it. Like you I also loved The Folding Knife. I find myself more and more looking forward to Parker's work, notably January's forthcoming, The Hammer. It's a shame I've read so few of her other books (none before The Company, I believe). Thanks for a great review! Thanks for a great review. K. J. Parker is meanwhile one of my favorite authors. The Folding Knife belongs to the list of books which I want to read until end of 2010 and of course I ordered a copy of The Hammer in advance. One of my current reads is The Belly of the Bow, the second book in the Fencer trilogy and it is as good as the other K. J. Parker books I read so far.